Sure you could carry around a little flash light on your key chain, or keep one in your car, but how about just sliding a perfectly good light source right into your wallet? 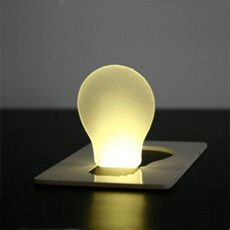 The Pocket Card LED Light is the same size as credit card and requires no batteries or wires. The interior piece has an LED light bulb, when you need to illuminate, you just flip it up and the light turns on.